To the Troops of the Pulkovo Detachment. November 13, 1917. 38 minutes past 9 a. m. After a cruel fight the troops of the Pulkovo detachment completely routed the counter-revolutionary forces, who retreated from their positions in disorder, and under cover of Tsarskoye Selo fell back toward Pavlovsk II and Gatchina. Our advanced units occupied the northeastern extremity of Tsarskoye Selo and the station Alexandrovskaya. The Colpinno detachment was on our left, the Krasnoye Selo detachment to our right. I ordered the Pulkovo forces to occupy Tsarskoye Selo, to fortify its approaches, especially on the side of Gatchina. Also to pass and occupy Pavlovskoye, fortifying its southern side, and to take up the railroad as far as Dno. The troops must take all measures to strengthen the positions occupied by them, arranging trenches and other defensive works. They must enter into close liaison with the detachments of Colpinno and Krasnoye Selo, and also with the Staff of the Commander in Chief for the Defence of Petrograd. Tuesday morning. But how is this? Only two days ago the Petrograd campagna was full of leaderless bands, wandering aimlessly; without food, without artillery, without a plan. What had fused that disorganised mass of undisciplined Red Guards, and soldiers without officers, into an army obedient to its own elected high command, tempered to meet and break the assault of cannon and Cossack cavalry? Sunday night, the Commissars of the Military Revolutionary Committee returning desperately from the field, the garrison of Petrograd elected its Committee of Five, its Battle Staff, three soldiers and two officers, all certified free from counter-revolutionary taint. Colonel Muraviov, ex-patriot, was in command—an efficient man, but to be carefully watched. At Colpinno, at Obukhovo, at Pulkovo and Krasnoye Selo were formed provisional detachments, increased in size as the stragglers came in from the surrounding country—mixed soldiers, sailors and Red Guards, parts of regiments, infantry, cavalry and artillery all together, and a few armoured cars. Day broke, and the pickets of Kerensky’s Cossacks came in touch. Scattered rifle-fire, summons to surrender. Over the bleak plain on the cold quiet air spread the sound of battle, falling upon the ears of roving bands as they gathered about their little fires, waiting…. So it was beginning! They made toward the battle; and the worker hordes pouring out along the straight roads quickened their pace…. Thus upon all the points of attack automatically converged angry human swarms, to be met by Commissars and assigned positions, or work to do. This was their battle, for their world; the officers in command were elected by them. For the moment that incoherent multiple will was one will…. Those who participated in the fighting described to me how the sailors fought until they ran out of cartridges, and then stormed; how the untrained workmen rushed the charging Cossacks and tore them from their horses; how the anonymous hordes of the people, gathering in the darkness around the battle, rose like a tide and poured over the enemy…. Before midnight of Monday the Cossacks broke and were fleeing, leaving their artillery behind them, and the army of the proletariat, on a long ragged front, moved forward and rolled into Tsarskoye, before the enemy had a chance to destroy the great Government wireless station, from which now the Commissars of Smolny were hurling out to the world paeans of triumph…. The 12th of November, in a bloody combat near Tsarskoye Selo, the revolutionary army defeated the counter-revolutionary troops of Kerensky and Kornilov. In the name of the Revolutionary Government I order all regiments to take the offensive against the enemies of the revolutionary democracy, and to take all measures to arrest Kerensky, and also to oppose any adventure which might menace the conquests of the Revolution and the victory of the proletariat. Long live the Revolutionary Army! At Sevastopol the local Soviet had assumed the power; a huge meeting of the sailors on the battleships in the harbour had forced their officers to line up and swear allegiance to the new Government. At Nizhni Novgorod the Soviet was in control. From Kazan came reports of a battle in the streets, yunkers and a brigade of artillery against the Bolshevik garrison…. Desperate fighting had broken out again in Moscow. The yunkers and White Guards held the Kremlin and the centre of the town, beaten upon from all sides by the troops of the Military Revolutionary Committee. The Soviet artillery was stationed in Skobeliev Square, bombarding the City Duma building, the Prefecture and the Hotel Metropole. The cobblestones of the Tverskaya and Nikitskaya had been torn up for trenches and barricades. A hail of machine-gun fire swept the quarters of the great banks and commercial houses. There were no lights, no telephones; the bourgeois population lived in the cellars…. The last bulletin said that the Military Revolutionary Committee had delivered an ultimatum to the Committee of Public Safety, demanding the immediate surrender of the Kremlin, or bombardment would follow. From Vologda to Chita in far Siberia, from Pskov to Sevastopol on the Black Sea, in great cities and little villages, civil war burst into flame. From thousands of factories, peasant communes, regiments and armies, ships on the wide sea, greetings poured into Petrograd—greetings to the Government of the People. In Finland, also, things were stirring. The Soviet of Helsingfors and the Tsentrobalt (Central Committee of the Baltic Fleet), jointly proclaimed a state of siege, and declared that all attempts to interfere with the Bolshevik forces, and all armed resistance to its orders, would be severely repressed. At the same time the Finnish Railway Union called a countrywide general strike, to put into operation the laws passed by the Socialist Diet of June, 1917, dissolved by Kerensky…. Early in the morning I went out to Smolny. Going up the long wooden sidewalk from the outer gate I saw the first thin, hesitating snow-flakes fluttering down from the grey, windless sky. “Snow!” cried the soldier at the door, grinning with delight. “Good for the health!” Inside, the long, gloomy halls and bleak rooms seemed deserted. No one moved in all the enormous pile. A deep, uneasy sound came to my ears, and looking around, I noticed that everywhere on the floor, along the walls, men were sleeping. Rough, dirty men, workers and soldiers, spattered and caked with mud, sprawled alone or in heaps, in the careless attitudes of death. Some wore ragged bandages marked with blood. Guns and cartridge-belts were scattered about…. The victorious proletarian army! In the upstairs buffet so thick they lay that one could hardly walk. The air was foul. Through the clouded windows a pale light streamed. A battered samovar, cold, stood on the counter, and many glasses holding dregs of tea. Beside them lay a copy of the Military Revolutionary Committee’s last bulletin, upside down, scrawled with painful hand-writing. It was a memorial written by some soldier to his comrades fallen in the fight against Kerensky, just as he had set it down before falling on the floor to sleep. The writing was blurred with what looked like tears…. These men were drafted into the Army on November 15th, 1916. Only three are left of the above. Sleep, Warrior eagles, sleep with peaceful soul. You have straitly closed your ranks. Sleep, Citizens! Only the Military Revolutionary Committee still functioned, unsleeping. Skripnik, emerging from the inner room, said that Gotz had been arrested, but had flatly denied signing the proclamation of the Committee for Salvation, as had Avksentiev; and the Committee for Salvation itself had repudiated the Appeal to the garrison. There was still disafiection among the city regiments, Skripnik reported; the Volhynsky Regiment had refused to fight against Kerensky. Several detachments of “neutral” troops, with Tchernov at their head, were at Gatchina, trying to persuade Kerensky to halt his attack on Petrograd. But there was an undercurrent of real anxiety in the tide of victory; the question of finances. Instead of opening the banks, as had been ordered by the Military Revolutionary Committee, the Union of Bank Employees had held a meeting and declared a formal strike. Smolny had demanded some thirty-five millions of rubles from the State Bank, and the cashier had locked the vaults, only paying out money to the representatives of the Provisional Government. The reactionaries were using the State Bank as a political weapon; for instance, when the Vikzhel demanded money to pay the salaries of the employees of the Government railroads, it was told to apply to Smolny…. I went to the State Bank to see the new Commissar, a redhaired Ukrainean Bolshevik named Petrovitch. He was trying to bring order out of the chaos in which affairs had been left by the striking clerks. In all the offices of the huge place perspiring volunteer workers, soldiers and sailors, their tongues sticking out of their mouths in the intensity of their effort, were poring over the great ledgers with a bewildered air…. The Duma building was crowded. There were still isolated cases of defiance toward the new Government, but they were rare. The Central Land Committee had appealed to the Peasants, ordering them not to recognise the Land Decree passed by the Congress of the Soviets, because it would cause confusion and civil war. Mayor Schreider announced that because of the Bolshevik insurrection, the elections to the Constituent Assembly would have to be indefinitely postponed. In accord with the proposals of the Committee for Salvation and all the democratic organisations united around it, I have halted all military action against the rebels. A delegate of the Committee has been sent to enter into negotiations. Take all measures to stop the useless shedding of blood. 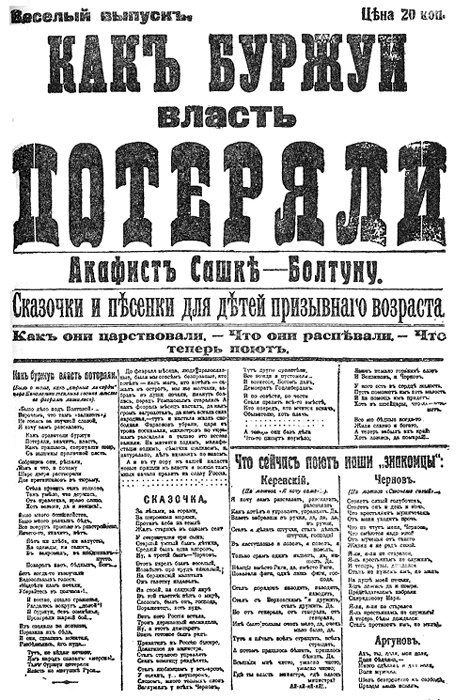 The Conference of the Union of Railway Workers with the representatives of both the belligerent parties, who admit the necessity of an agreement, protest energetically against the use of political terrorism in the civil war, especially when it is carried on between different factions of the revolutionary democracy, and declare that political terrorism, in whatever form, is in contradiction to the very idea of the negotiations for a new Government…. the old Tsay-ee-kah, and the rest split up among the Town Dumas, the Trade Unions, Land Committees and political parties. Tchernov was mentioned as the new Premier. Lenin and Trotzky, rumour said, were to be excluded…. About noon I was again in front of Smolny, talking with the driver of an ambulance bound for the revolutionary front. Could I go with him? Certainly! He was a volunteer, a University student, and as we rolled down the street shouted over his shoulder to me phrases of execrable German: “Also, gut! Wir nach die Kasernen zu essen gehen!” I made out that there would be lunch at some barracks. On the Kirotchnaya we turned into an immense courtyard surrounded by military buildings, and mounted a dark stairway to a low room lit by one window. At a long wooden table were seated some twenty soldiers, eating shtchi (cabbage soup) from a great tin wash-tub with wooden spoons, and talking loudly with much laughter. “Welcome to the Battalion Committee of the Sixth Reserve Engineers’ Battalion!” cried my friend, and introduced me as an American Socialist. Whereat every one rose to shake my hand, and one old soldier put his arms around me and gave me a hearty kiss. A wooden spoon was produced and I took my place at the table. Another tub, full of kasha, was brought in, a huge loaf of black bread, and of course the inevitable tea-pots. At once every one began asking me questions about America: Was it true that people in a free country sold their votes for money? If so, how did they get what they wanted? How about this “Tammany”? Was it true that in a free country a little group of people could control a whole city, and exploited it for their personal benefit? Why did the people stand it? Even under the Tsar such things could not happen in Russia; true, here there was always graft, but to buy and sell a whole city full of people! And in a free country! Had the people no revolutionary feeling? I tried to explain that in my country people tried to change things by law. I said that I was going to Tsarskoye Selo. “I, too,” said Baklanov, suddenly. “And I—and I—” The whole roomful decided on the spot to go to Tsarskoye Selo. Baklanov considered. “I do not think there is anything to be done here to-day,” he answered. “Yes, comrade, we shall be very glad to have you.” The Colonel thanked him and sat down, filling a glass of tea. Arms were distributed to us, revolvers and rifles—“we might meet some Cossacks, you know”—and we all piled into the ambulance, together with three great bundles of newspapers for the front. Straight down the Liteiny we rattled, and along the Zagorodny Prospekt. Next to me sat a youth with the shoulder-straps of a Lieutenant, who seemed to speak all European languages with equal fluency. He was a member of the Battalion Committee. “But how——?” I began, bewildered. “Provocator! Kornilovitz!” the others cried at him gaily, slapping him on the shoulder…. Passing under the huge grey stone archway of the Moskovsky Gate, covered with golden hieroglyphics, ponderous Imperial eagles and the names of Tsars, we sped out on the wide straight highway, grey with the first light fall of snow. It was thronged with Red Guards, stumbling along on foot toward the revolutionary front, shouting and singing; and others, greyfaced and muddy, coming back. Most of them seemed to be mere boys. Women with spades, some with rifles and bandoleers, others wearing the Red Cross on their arm-bands—the bowed, toil-worm women of the slums. Squads of soldiers marching out of step, with an affectionate jeer for the Red Guards; sailors, grim-looking; children with bundles of food for their fathers and mothers; all these, coming and going, trudged through the whitened mud that covered the cobbles of the highway inches deep. We passed cannon, jingling southward with their caissons; trucks bound both ways, bristling with armed men; ambulances full of wounded from the direction of the battle, and once a peasant cart, creaking slowly along, in which sat a white-faced boy bent over his shattered stomach and screaming monotonously. In the fields on either side women and old men were digging trenches and stringing barbed wire entanglements. Back northward the clouds rolled away dramatically, and the pale sun came out. Across the flat, marshy plain Petrograd glittered. To the right, white and gilded and coloured bulbs and pinnacles; to the left, tall chimneys, some pouring out black smoke; and beyond, a lowering sky over Finland. On each side of us were churches, monasteries…. Occasionally a monk was visible, silently watching the pulse of the proletarian army throbbing on the road. At Pulkovo the road divided, and there we halted in the midst of a great crowd, where the human streams poured from three directions, friends meeting, excited and congratulatory, describing the battle to one another. A row of houses facing the cross-roads was marked with bullets, and the earth was trampled into mud half a mile around. The fighting had been furious here…. In the near distance riderless Cossack horses circled hungrily, for the grass of the plain had died long ago. Right in front of us an awkward Red Guard was trying to ride one, falling off again and again, to the childlike delight of a thousand rough men. The left road, along which the remnants of the Cossacks had retreated, led up a little hill to a hamlet, where there was a glorious view of the immense plain, grey as a windless sea, tumultuous clouds towering over, and the imperial city disgorging its thousands along all the roads. Far over to the left lay the little hill of Kranoye Selo, the parade-ground of the Imperial Guards’ summer camp, and the Imperial Dairy. In the middle distance nothing broke the flat monotony but a few walled monasteries and convents, some isolated factories, and several large buildings with unkempt grounds that were asylums and orphanages…. And so we came into Tsarskoye, all bustling with the swaggering heroes of the proletarian horde. Now the palace where the Soviet had met was a busy place. Red Guards and sailors filled the court-yard, sentries stood at the doors, and a stream of couriers and Commissars pushed in and out. In the Soviet room a samovar had been set up, and fifty or more workers, soldiers, sailors and officers stood around, drinking tea and talking at the top of their voices. In one corner two clumsy-handed workingmen were trying to make a multigraphing machine go. At the centre table, the huge Dybenko bent over a map, marking out positions for the troops with red and blue pencils. In his free hand he carried, as always, the enormous bluesteel revolver. Anon he sat himself down at a typewriter and pounded away with one finger; every little while he would pause, pick up the revolver, and lovingly spin the chamber. Dybenko looked up as we came in. “Ah,” he said to Baklanov. “Comrade, will you go up to the Commandant’s headquarters and take charge? Wait; I will write you credentials.” He went to the typewriter and slowly picked out the letters. The new Commandant of Tsarskoye Selo and I went toward the Ekaterina Palace, Baklanov very excited and important. In the same ornate, white room some Red Guards were rummaging curiously around, while my old friend, the Colonel, stood by the window biting his moustache. He greeted me like a long-lost brother. At a table near the door sat the French Bessarabian. The Bolsheviki had ordered him to remain, and continue his work. The Red Guard sneered knowingly. “Very convenient,” he said. I swung the axe. The wooden chest was empty. Baklanov did not want to. “Oh, no,” he said. “It was the Kornilovitz before him. He is not to blame. “The devil!” cried the Red Guard. “He is Kerensky’s man, I tell you. If you won’t arrest him, then we will, and we’ll take him to Petrograd and put him in Peter-Paul, where he belongs!” At this the other Red Guards growled assent. With a piteous glance at us the Colonel was led away…. Down in front of the Soviet palace an auto-truck was going to the front. Half a dozen Red Guards, some sailors, and a soldier or two, under command of a huge workman, clambered in, and shouted to me to come along. Red Guards issued from headquarters, each of them staggering under an arm-load of small, corrugated-iron bombs, filled with grubit—which, they say, is ten times as strong, and five times as sensitive as dynamite; these they threw into the truck. A three-inch cannon was loaded and then tied onto the tail of the truck with bits of rope and wire. We started with a shout, at top speed of course; the heavy truck swaying from side to side. The cannon leaped from one wheel to the other, and the grubit bombs went rolling back and forth over our feet, fetching up against the sides of the car with a crash. The big Red Guard, whose name was Vladimir Nicolaievitch, plied me with questions about America. “Why did America come into the war? Are the American workers ready to throw over the capitalists? What is the situation in the Mooney case now? Will they extradite Berkman to San Francisco?” and other, very difficult to answer, all delivered in a shout above the roaring of the truck, while we held on to each other and danced amid the caroming bombs. Occasionally a patrol tried to stop us. Soldiers ran out into the road before us, shouted “Shtoi!” and threw up their guns. We paid no attention. “The devil take you!” cried the Red Guards. “We don’t stop for anybody! We’re Red Guards!” And we thundered imperiously on, while Vladimir Nicolaievitch bellowed to me about the internationalisation of the Panama Canal, and such matters…. About five miles out we saw a squad of sailors marching back, and slowed down. They climbed into the truck, and we proceeded. It must have been about a mile further that Vladimir Nicolaievitch cocked his ear and shouted to the chauffeur to stop. “Firing!” he said. “Do you hear it?” For a moment dead silence, and then, a little ahead and to the left, three shots in rapid succession. Along here the side of the road was heavily wooded. Very much excited now, we crept along, speaking in whispers, until the truck was nearly opposite the place where the firing had come from. Descending, we spread out, and every man carrying his rifle, went stealthily into the forest. Two comrades, meanwhile, detached the cannon and slewed it around until it aimed as nearly as possible at our backs. It was silent in the woods. The leaves were gone, and the tree-trunks were a pale wan colour in the low, sickly autumn sun. Not a thing moved, except the ice of little woodland pools shivering under our feet. Was it an ambush? We went uneventfully forward until the trees began to thin, and paused. Beyond, in a little clearing, three soldiers sat around a small fire, perfectly oblivious. Vladimir Nicolaievitch stepped forward. “Zra’zvuitye, comrades!” he greeted, while behind him one cannon, twenty rifles and a truck-load of grubit bombs hung by a hair. The soldiers scrambled to their feet. The truck hurtled on toward Romanov, through the bright, empty day. At the first cross-roads two soldiers ran out in front of us, waving their rifles. We slowed down, and stopped. In order not to make any trouble, I got down from the truck, and watched it disappear careening down the road, all the company waving farewell. The soldiers consulted in low tones for a moment, and then led me to a wall, against which they placed me. It flashed upon me suddenly; they were going to shoot me! In all three directions not a human being was in sight. The only sign of life was smoke from the chimney of a datchya, a rambling wooden house a quarter of a mile up the side road. The two soldiers were walking out into the road. Desperately I ran after them. They stared stupidly at my pass, then at each other. The bearer of this pass, John Reed, is a representative of the American Social-Democracy, an internationalist…. Out on the road again the two soldiers held another consultation. “We must take you to the Regimental Committee,” they said. In the fast-deepening twilight we trudged along the muddy road. Occasionally we met squads of soldiers, who stopped and surrounded me with looks of menace, handling my pass around and arguing violently as to whether or not I should be killed…. It was dark when we came to the barracks of the Second Tsarskoye Selo Rifles, low sprawling buildings huddled along the post-road. A number of soldiers slouching at the entrance asked eager questions. A spy? A provocator? We mounted a winding stair and emerged into a great, bare room with a huge stove in the centre, and rows of cots on the floor, where about a thousand soldiers were playing cards, talking, singing, and asleep. In the roof was a jagged hole made by Kerensky’s cannon…. I stood in the doorway, and a sudden silence ran among the groups, who turned and stared at me. Of a sudden they began to move, slowly and then with a rush, thundering, with faces full of hate. “Comrades! Comrades!” yelled one of my guards. “Committee! Committee!” The throng halted, banked around me, muttering. Out of them shouldered a lean youth, wearing a red arm-band. “Who is this?” he asked roughly. The guards explained. “Give me the paper!” He read it carefully, glancing at me with keen eyes. Then he smiled and handed me the pass. “Comrades, this is an American comrade. I am Chairman of the Committee, and I welcome you to the Regiment….” A sudden general buzz grew into a roar of greeting, and they pressed forward to shake my hand. He led me across the court-yard to the door of another building. An aristocratic-looking youth, with the shoulder straps of a Lieutenant, was entering. The Chairman presented me, and shaking hands, went back. “I am Stepan Georgevitch Morovsky, at your service,” said the Lieutenant, in perfect French. From the ornate entrance hall a ceremonial staircase led upward, lighted by glittering lustres. On the second floor billiard-rooms, card-rooms, a library opened from the hall. We entered the dining-room, at a long table in the centre of which sat about twenty officers in full uniform, wearing their gold- and silver-handled swords, the ribbons and crosses of Imperial decorations. All rose politely as I entered, and made a place for me beside the Colonel, a large, impressive man with a grizzled beard. Orderlies were deftly serving dinner. The atmosphere was that of any officers’ mess in Europe. Where was the Revolution? “You are not Bolsheviki?” I asked Morovsky. A smile went around the table, but I caught one or two glancing furtively at the orderly. Dinner over, maps were brought, and the Colonel spread them out on the table. The rest crowded around to see. Just then the door of the room opened, and there entered the Chairman of the Regimental Committee, with another soldier. They joined the group behind the Colonel, peering at the map. There was a short silence. The Colonel again turned to the map. “Very well,” he said, in a different voice. “Stepan Georgevitch, you will please——” Rapidly tracing lines with a blue pencil, he gave his orders, while a sergeant made shorthand notes. The sergeant then withdrew, and ten minutes later returned with the orders typewritten, and one carbon copy. The Chairman of the Committee studied the map with a copy of the orders before him. “All right,” he said, rising. Folding the carbon copy, he put it in his pocket. Then he signed the other, stamped it with a round seal taken from his pocket, and presented it to the Colonel…. I returned to the Soviet palace in Tsarskoye in the Regimental Staff automobile. Still the crowds of workers, soldiers and sailors pouring in and out, still the choking press of trucks, armoured cars, cannon before the door, and the shouting, the laughter of unwonted victory. Half a dozen Red Guards forced their way through, a priest in the middle. This was Father Ivan, they said, who had blessed the Cossacks when they entered the town. I heard afterward that he was shot…. Dybenko was just coming out, giving rapid orders right and left. In his hand he carried the big revolver. An automobile stood with racing engine at the kerb. Alone, he climbed in the rear seat, and was off—off to Gatchina, to conquer Kerensky. Toward nightfall he arrived at the outskirts of the town, and went on afoot. What Dybenko told the Cossacks nobody knows, but the fact is that General Krasnov and his staff and several thousand Cossacks surrendered, and advised Kerensky to do the same. “I went out and called the Cossack Russkov, of the Tenth Regiment of the Don, and ordered him to pick out ten Cossacks to accompany the Supreme Commander. Half an hour later the Cossacks came to tell me that Kerensky was not in his quarters, that he had run away. And so Kerensky fled, alone, “disguised in the uniform of a sailor,” and by that act lost whatever popularity he had retained among the Russian masses…. I went back to Petrograd riding on the front seat of an auto truck, driven by a workman and filled with Red Guards. We had no kerosene, so our lights were not burning. The road was crowded with the proletarian army going home, and new reserves pouring out to take their places. Immense trucks like ours, columns of artillery, wagons, loomed up in the night, without lights, as we were. We hurtled furiously on, wrenched right and left to avoid collisions that seemed inevitable, scraping wheels, followed by the epithets of pedestrians. Across the horizon spread the glittering lights of the capital, immeasurably more splendid by night than by day, like a dike of jewels heaped on the barren plain. The old workman who drove held the wheel in one hand, while with the other he swept the far-gleaming capital in an exultant gesture. Military Revolutionary Committee. Bulletin No. 2 November 12th, in the evening, Kerensky sent a proposition to the revolutionary troops—to lay down their arms. Kerensky’s men opened artillery fire. Our artillery answered and compelled the enemy to be silent. The Cossacks assumed the offensive. The deadly fire of the sailors, the Red Guards and the soldiers forced the Cossacks to retreat. Our armoured cars rushed in among the ranks of the enemy. The enemy is fleeing. Our troops are in pursuit. The order has been given to arrest Kerensky. Tsarskoye Selo has been taken by the revolutionary troops. The Lettish Riflemen: The Military Revolutionary Committee has received precise information that the valiant Lettish Riflemen have arrived from the Front and taken up a position in the rear of Kerensky’s bands. The seizure of Gatchina and Tsarskoye Selo by Kerensky’s detachments is to be explained by the complete absence of artillery and machine-guns in these places, whereas Kerensky’s cavalry was provided with artillery from the beginning. The last two days were days of enforced work for our Staff, to provide the necessary quantity of guns, machine-guns, field telephones, etc., for the revolutionary troops. When this work—with the energetic assistance of the District Soviets and the factories (the Putilov Works, Obukhov and others)—was accomplished, the issue of the expected encounter left no place for doubt: on the side of the revolutionary troops there was not only a surplus in quantity and such a powerful material base as Petrograd, but also an enormous moral advantage. All the Petrograd regiments moved out to the positions with tremendous enthusiasm. The Garrison Conference elected a Control Commission of five soldiers, thus securing a complete unity between the commander in chief and the garrison. At the Garrison Conference it was unanimously decided to begin decisive action. The artillery fire on the 12th of November developed with extraordinary force by 3 P.M. The Cossacks were completely demoralised. A parliamentarian came from them to the staff of the detachment at Krasnoye Selo, and proposed to stop the firing, threatening otherwise to take decisive measures. He was answered that the firing would cease when Kerensky laid down his arms. In the developing encounter all sections of the troops—the sailors, soldiers and the Red Guards—showed unlimited courage. The sailors continued to advance until they had fired all their cartridges. The number of casualties has not been established yet, but it is larger on the part of the counter-revolutionary troops, who experienced great losses through one of our armoured cars. Kerensky’s staff, fearing that they would be surrounded, gave the order to retreat, which retreat speedily assumed a disorderly character. By 11-12 P.M., Tsarkoye Selo, including the wireless station, was entirely occupied by the troops of the Soviets. The Cossacks retreated towards Gatchina and Colpinno. The morale of the troops is beyond all praise. The order has been given to pursue the retreating Cossacks. From the Tsarskoye Selo station a radio-telegram was sent immediately to the Front and to all local Soviets throughout Russia. Further details will be communicated…. Events Of The 13th In Petrograd Three regiments of the Petrograd garrison to take any part in the battle against Kerensky. On the morning of the 13th they summoned to a joint conference sixty delegates from the Front, in order to find some way to stop the civil war. This conference appointed a committee to go and persuade Kerensky’s troops to lay down their arms. They proposed to ask the Government soldiers the following questions: (1) Will the soldiers and Cossacks of Kerensky recognise the Tsay-ee-kah as the repository of Governmental power, responsible to the Congress of Soviets? (2) Will the soldiers and Cossacks accept the decrees of the second Congress of Soviets? (3) Will they accept the Land and Peace decrees? (4) Will they agree to cease hostilities and return to their units? (5) Will they consent to the arrest of Kerensky, Krasnov and Savinkov? At the meeting of the Petrograd Soviet, Zinoviev said, It would be foolish to think that this committee could finish affair. The enemy can only be broken by force. However, it would be a crime for us not to try every peaceful means to bring the Cossacks over to us…. What we need is a military victory…. The news of an armistice is premature. Our Staff will be ready to conclude an armistice when the enemy can no longer do any harm…. At the City Duma all attention was concentrated on the formation of the new Government. In many factories and barracks already Revolutionary Tribunals were operating, and the Bolsheviki were threatening to set up more of these, and try Gotz and Avksentiev before them. Dan proposed that an ultimatum be sent demanding the abolition of these Revolutionary Tribunals, or the other members of the Conference would immediately break off all negotiations with the Bolsheviki. Yartsev, for the Yedinstvo group, declared that any agreement with the Bolsheviki would be equivalent to a Bolshevik victory…. After other speakers, of which only the representative of the Mensheviki Internationalists was in favour of considering the admission of the Bolsheviki into the new Government, the Duma voted to continue its representatives in the Vikzhel’s conference, but to insist upon the restoration of the Provisional Government before everything, and to exclude the Bolsheviki from the new power…. Truce. 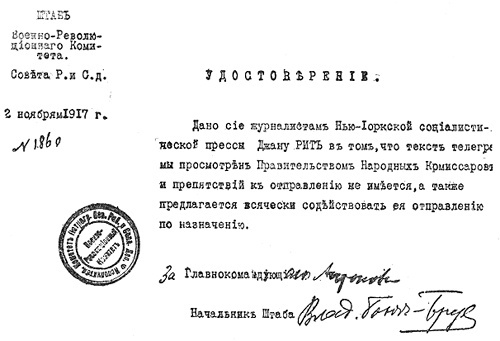 Krasnov’S Answer To The Committee For Salvation “In answer to your telegram proposing an immediate armistice, the Supreme Commander, not wishing further futile bloodshed, consents to enter into negotiations and to establish relations between the armies of the Government and the insurrectionists. He proposes to the General Staff of the insurrectionists to recall its regiments to Petrograd, to declare the line Ligovo-Pulkovo-Colpinno neutral, and to allow the advance-guards of the Government cavalry to enter Tsarskoye Selo, for the purpose of establishing order. The answer to this proposal must be placed in the hands of our envoys before eight o’clock to-morrow morning. Events At Tsarskoye Selo On the evening that Kerensky’s troops retreated from Tsarskoye Selo, some priests organised a religious procession through the streets of the town, making speeches to the citizens in which they asked the people to support the rightful authority, the Provisional Government. When the Cossacks had retreated, and the first Red Guards entered the town, witnesses reported that the priests had incited the people against the Soviets, and had said prayers at the grave of Rasputin, which lies behind the Imperial Palace. One of the priests, Father Ivan Kutchurov, was arrested and shot by the infuriated Red Guards…. Just as the Red Guards entered the town the electric lights were shut off, plunging the streets in complete darkness. The director of the electric light plant, Lubovitch, was arrested by the Soviet troops and asked why he had shut off the lights. He was found some time later in the room where he had been imprisoned with a revolver in his hand and a bullet hole in his temple. The Petrograd anti-Bolshevik papers came out next day with headlines, “Plekhanov’s temperature 39 degrees! Plekhanov lived at Tsarskoye Selo, where he was lying ill in bed. Red Guards arrived at the house and searched it for arms, questioning the old man. “What class of society do you belong to? they asked him. The workers no longer knew Plekhanov, pioneer of the Russian Social Democracy! Appeal Of The Soviet Government “The detachments at Gatchina, deceived by Kerensky, have laid down their arms and decided to arrest Kerensky. That chief of the counter-revolutionary campaign has fled. The Army, by an enormous majority, has pronounced in favour of the second All-Russian Congress of Soviets, and of the Government which it has created. Scores of delegates from the Front have hastened to Petrograd to assure the Soviet Government of the Army’s fidelity. No twisting of the facts, no calumny against the revolutionary workers, soldiers, and peasants, has been able to defeat the People. The Workers’ and Soldiers’ Revolution is victorious…. “The Tsay-ee-kah appeals to the troops which march under the flag of the counter-revolution, and invites them immediately to lay down their arms—to shed no longer the blood of their brothers in the interests of a handful of land-owners and capitalists. The Workers’, Soldiers’ and Peasants’ Revolution curses those who remain even for a moment under the flag of the People’s enemies….